Overwhelmed with stress, Amy (Mila Kunis), Kiki (Kristen Bell) and Carla (Kathryn Hahn) decide to take Christmas back and rediscover the fun of the festive season. No more perfect gifts, no more perfect decorations… no more perfect anything. So far so good, until the unthinkable happens - the Bad Moms’ Bad Moms come to stay. Bad Moms was, for me at least, one of last year’s most entertaining surprises. I went in with low expectations and left the cinema buzzing. I’d had a blast with Amy, Kiki and (particularly) Carla and I had laughed… a lot. As a result, I looked forward to the return of the overburdened trio. This time, the Moms are targeting the sheer craziness of Christmas - a situation, I am sure, to which many of us can relate. Cue more raucous and drunken antics as the Moms rampage around a shopping centre and, in one slightly uncomfortable sequence, cavort with a department store santa. It's all silly, harmless fun. Indeed, I laughed pretty consistently throughout A Bad Moms Christmas (although I do feel that the frequent ‘f’ word usage has ever diminishing comedic returns). Kunis, Bell and (the effortlessly scene-stealing) Hahn are, once again, imminently likeable and always extremely entertaining to watch. Of course, A Bad Moms Christmas does not just feature three moms. 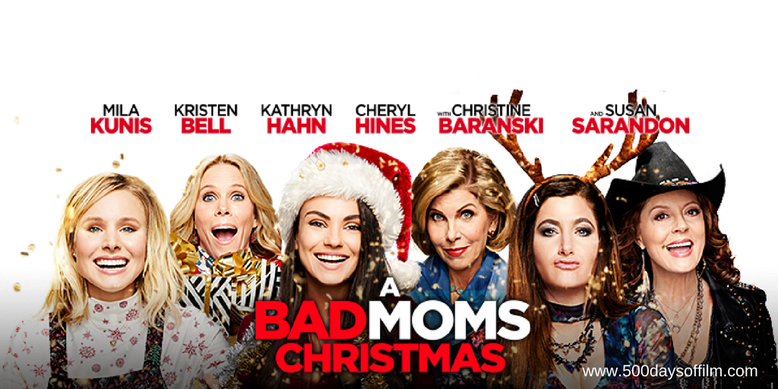 The sequel gleefully introduces Amy, Kiki and Carla’s own Bad Moms - Ruth (Christine Baranski), Sandy (Cheryl Hines) and Isis (Susan Sarandon). Kudos to the film’s casting director, these mother/daughter pairings work perfectly. The film follows all three challenging relationships - each hilarious in its own way. While the story focuses on Amy and Ruth (a fabulous performance from Baranski), I loved the dynamic between Isis and Carla. Susan Sarandon, like Hahn, steals every scene. There is definite mileage here for a Bad Grandmoms spin-off. As with the original, what makes Jon Lucas and Scott Moore’s film work is that, beneath the crudity, lies a big heart. Thankfully, there is no mean spiritedness here. These Moms are not really bad at all. They are all trying their best to be good mothers and daughters. While the original is perhaps funnier and more satisfying, A Bad Moms Christmas is a sleigh full of ridiculous fun - just the tonic we need in preparation for the forthcoming festive season.